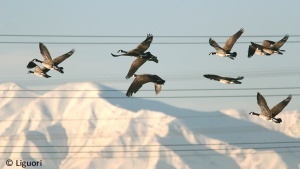 Power lines located between feeding and roosting areas of flocking birds may present an increased collision risk. This is especially true for lines near rivers, lakes, or wetlands where fog may be common, making lines less visible. Human activity near lines may flush birds, with startled bird potentially colliding with power lines. Heavy-bodied, less agile birds, or those within flocks may lack the ability to quickly negotiate obstacles, making them more vulnerable to power line collisions. Collisions most often occur with the overhead static wire, which may be less visible than energized conductors due to its smaller diameter. Most bird collisions involve waterfowl, pelicans, and cranes. Power line spans in collision risk areas may be marked to make the wires more visible to flying birds. A variety of line marking devices, including hanging markers, coils, and aviation marker balls, are commercially available. Line markers should be evaluated and approved by company engineers prior to use. On December 20, 2012, APLIC and the U.S. 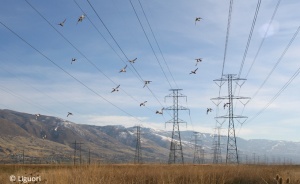 Fish and Wildlife Service released their updated state-of-the-art guidance document Reducing Avian Collisions with Power Lines: State of the Art in 2012. 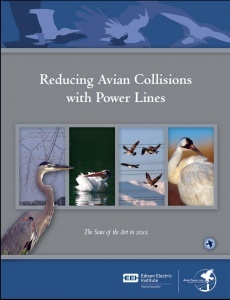 This best-practices document, originally published in 1994, offers electric utilities and cooperatives, federal power administrations, wildlife agencies, and other stakeholders with specific guidance for reducing bird collisions with power lines based on the most current published science and technical information.